City: Malambo Country: Colombia Loan Use: To open new lines of products. Gustavo Isaac Castillo Gilis a hardworking entrepreneur and healthy lifestyle advocate who lives in Malambo, Colombia with his mother and father. He is passionate about health and fitness, and for the last few years, has owned and operated a shop where he sells products for athletes and fitness enthusiasts. His business savvy allowed him to grow what was a small grocery store into a popular niche market. Despite his hard work, it hasn’t always been easy for Gustavo—recently he could not afford to bring in new product lines to his store, which led him to worry about the future of his shop. Everything began to change when a friend encouraged Gustavo to join Opportunity International. Gustavo received financial training and a loan to purchase inventory in bulk. 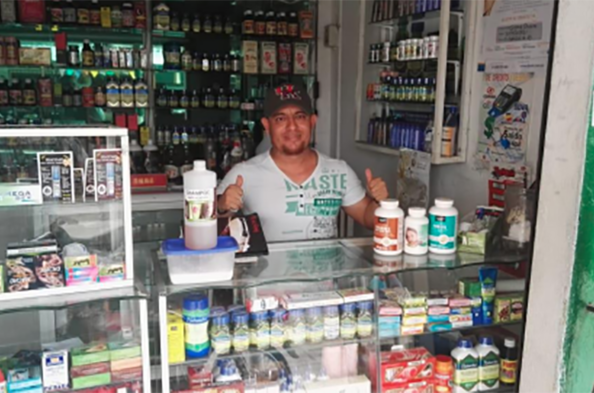 With more products to sell and a greater diversity of health products on the shelves, Gustavo was able to attract new customers and increase his sales. The loan also gave him the confidence he needed to promote sports and fitness-related activities in his town to encourage community health. Thanks to his loan, Gustavo can now continue to grow his business and serve athletes in his community, all while caring for his parents in their old age.